Google shows results from its code search engine when you search for things related to programming languages: function names, classes, objects, methods so you can see real-life examples of use. For some reason, the snippets are always displayed after the third search result and they include up to four lines of code. 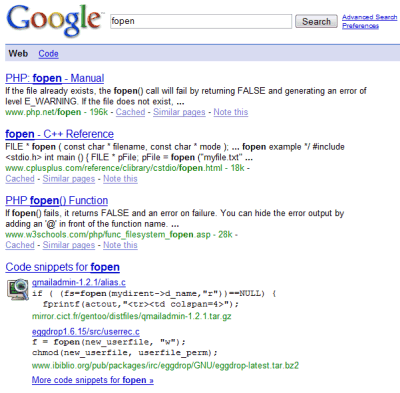 Google Code Search indexes "publicly accessible source code hosted on the Internet" and is the only search engine developed by Google that supports regular expressions and case-sensitive searches. It's also the only Google search engine that has keyboard shortcuts: after clicking on a search result, type n and p to go to the next/previous match. I had heard an April Fool like news, that Google is going to open with its indexes. If Krugle can use such indexes through some kind of "Google Code API", this will be a good news to developers around the world. I just wonder whether there can be some kind of finance incentive arrangements for such solution to come true. "It's also the only Google search engine that has keyboard shortcuts: after clicking on a search result, type n and p to go to the next/previous match." That's true, but it's just an experimental feature. I don't think it will ever be added to the standard interface.